development and livelihood for poor resourceless communities. 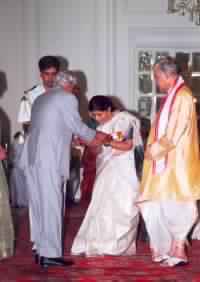 Anupama Education Society is a Non Government, Non Political, Non Profit, President awarded and women headed organization registered under Society Registration Act 1973. The Organization works for the welfare, upliftment and empowerment of women and Children. The Society adopts diverse methods for achievement of its objectives and to fulfill its mission. The work area of the Organization is entire India and presently the organization is working in 22 districts of Madhya Pradesh. The Four major pilgrims of Organization are Health, Education, Livelihood and Women empowerment. The Organization is also registered under the Foreign Contribution Regulation Act 1976 in the year 1999, under the Section 12 A and 80 G of the Income tax Act. The Organization has a managing body, which comprise of the experienced persons on the subject matters as well as the written bylaws and the HR policy. On behalf of AES, Shaila Tiwari, Secretary AES and Nita Jaiswal, Jt. 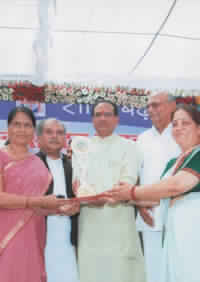 Secretary received award from M.P Chief Minister Hon. Shivraji Singh Chauhan for Excellent work on Education, Livelihood, Health and Women Empowerment in Satna Dist. AES has formed mpre than 3500 SHGs through different projects (DPIP, NABARD,Tejaswini Project, SJSY, NULM etc.) in all over its operational area and linked them with banks for loans to initiate livelihood activities. As the women are regularly being subjected to inequality, discrimination and domestic violence, AES aims at their empowerment by developing leadership qualities among them to increase their participation in the development process. In education sector AES run Anupama Higher Secondary School, Anupama Public School and Anupama International in Satna. AES conducts various non-formal education courses like Bridge Course, Special Child Labour Schools, Creche Centers and Children Library. Under distance courses B.A., B.Sc. B.Com, M.A., M.S.W. etc. Education Center for High School and Higher Secondary Certificates under National Institute for Open Schooling is also conducted. Anupama Education Society (AES) is a reputed non-governmental organisation based in Satna, in India's central State of Madhya Pradesh. AES is a women-led organisation, primarily working for the development of women and children. Founded on Children's Day (November 14) in the year 1991, AES was registered as a society the following year. Ever since then the organisation has gained strength with each passing year.